Discus spawning and the first days after hatching of larvae is a time of rest for the aquarist, but also the time of preparation for the next stage of the breeding – feeding fry. Since the laying of eggs by a pair of discus we have 9 days off – it will take three days incubation of eggs, three days larvae discus will need to absorb the yolk sac, three days the fry will feed only their parents’ skin secretions. After this time, be ready for intensive feeding of discus-puppies. Now, a lot will depend on the aquarist – if you can handle it fine, young discus in the week after the start of swimming should try to eat food from the bottom of tank. They should be more or less the same size as this film, but let’s get back to the start of feeding fry – about 7-th day after hatching. Food suitable for feeding a tiny discus is Artemia (Brine Shrimp). Fish are fed newly hatched artemia naupli. Breeding brine shrimp is quite simple, but I describe it in more detail in another article. Another good food for young discus fish are called micro nematodes, but I’ve never had to deal with this food in my practice, so I will focus on information about feeding Artemia. I put a strained Artemia reared in a transparent container with about 100 ml of aquarium water. It may be a glass, jar, laboratory flask, etc. Container should be transparent because then the shrimp larvae are easily visible. I’m currently using for this purpose container from JBL Artemio Set. As the fry at that time is “sitting” on their parents, I give them their food using a plastic pipette. It is easily drawn up into the pipette from a transparent container as I see what I’m doing. Now comes the time to first feeding. At this point we find out whether the parents of young discus will hinder us in this and how much – discus are cichlids so they defend their fry. Do not make sudden movements near the aquarium, so do not fret unnecessarily adult discus. Feeding involves gently blow shrimp from the pipette directly into a group of juveniles residing at the back of a parent. 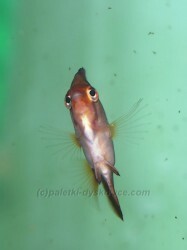 Floating Artemia will interest fry and provoke them to capture. The first time you can get the feeling that the little discus are not interested in this food. Do not worry – this is absolutely normal and do not let this discourage you. After about 2-3 hours repeat feeding. In the early days some of the shrimp is wasted, but from day to day the fry will be willing to swim farther and farther from their parents, hunting for swimming shrimp larvae. A sign that everything is going well, it is noticeable every day fry growth. In addition to the artemia larvae, from the first days I use the dry food – Hikari First Bites. This is an excellent microGranulate quite willingly eaten by tiny discus. After mixing a small portion in a tablespoon of aquarium water, I feed with pipette blowing food-dust on the backs of discus-parents. Food sticks to the skin of feeding discus, which at that time have a lot of mucus for feeding fry. With intensive feeding of juveniles in the early days, a large quantity of sediment from uneaten shrimp can be produced in aquarium. It is not necessary at this time, exaggerated care for the purity of aquarium if its capacity is adequate (about 150L of water), but you can drain thicker sediment from the bottom using a thin tube that does not drain too much water. After one week, you can begin to exchange small amounts of water with the parameters used to keep adult fish every day to accustom young discus to harder water. Soft osmosis water is needed only during the incubation of eggs and in the first days of life of juveniles. I feed discus fry with Artemia to the age of about 3 weeks. You can feed longer but because the discus at this age are of approximately 1.5-2 cm size, artemia food ceases to be inefficient and must now give the fish a bit thicker food. I just feed a mix of finely minced meat (turkey hearts, spinach, vitamin) from 2 weeks since the young had already begin to fry the meat-food from parents and artemia begins to be only the complementary food. 4 weeks old discus juveniles can be separated from their parents, who may have little to show impatience as the small discus although they eat normal food already, they can bite very hard their parents. In extreme cases there may be pitting on the skin and fins of adult fish if they can not effectively defend against biting. Among my adult discus, I have both a male who can deal well with the aggressiveness of young, and a male who young once eaten 1/3 of dorsal fin at a time when I temporarily had no tank where I could move the parents. After the young discus are alone, you just feed them heavily with good quality food. The base may be a meat-mix with addition of about 30% of the spinach, and vitamins. As vitamin I use “Vibovit Junior” with vanilla flavor by adding 2 sachet per 1 kg of meat-mix. A good food will also be cocktail shrimp (unsalted), and sea fish meat (no bones of course). The aquarist should benefit from a huge appetite of young discus and feed them very rich, of course, making sure that food does not stack up too long in aquarium. Excessive cleanliness of tank at that time is not for anything young discus need so you should just take care that the pH does not drop below 4. With high population of fish, of course, it could mean a daily change of considerable amount of water. However, each time polishing the glass and the bottom of the aquarium is absolutely not necessary and may even be harmful as well as the use of UV lamps. Discus should be accustomed to the presence of microorganisms that live in all water bodies and are responsible for decomposition of sludge – rotifers, ciliates, etc. These organisms do not threaten healthy fish, but overly “sensitive” fish, delicate fish, when they go to the aquarium where it is gravel, may then have problems with acclimatization. So just don’t keep things too clean when bringing up a discus fry. Furthermore, in a tank where we keep discus fish fry must necessarily be installed fairly intense aeration, preferably from two independent sources. Thank you for reading Maria. Yes, I wish you luck Rhonda, absolutely! Aquaristics - website about discus fish. All rights reserved. The use of images and the reprint of articles from this site without the author's written permission are forbidden.